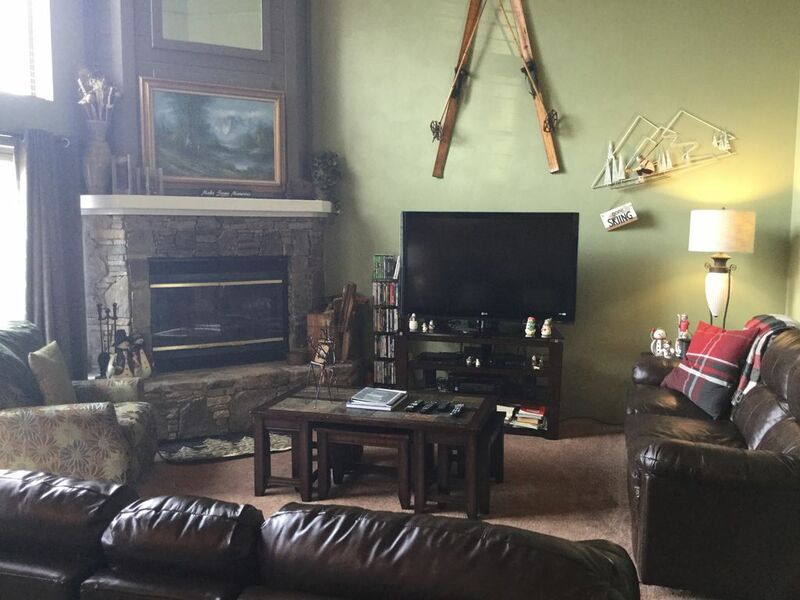 TOWNHOME AT 7 SPRINGS IN WOODRIDGE, SLEEPS 8 WITH HOT TUB, AND PETS WELCOME! Luxury townhouse that sleeps eight. Located in the coveted Villages at 7 Springs Mountain Resort. You can enjoy all the resort has to offer, skiing, top rated spa, bowling, indoor swimming pool, hiking, snow tubing, snow mobile, horse back riding, clay shooting, bands, bars, fine dining, shopping an so much beautiful Pennsylvania mountain scenery that you will never want to leave! This townhome is luxurious, and you will have all that you want to make memories of a lifetime with your family and/or friends. There is a king size bed in the master suite that has an on suite with a jetted tub. The second bedroom upstairs has a queen size bed and there is another room with two twin beds - which share a full bathroom. The first floor has an additional bedroom with a queen size bed. The main great room space is very spacious with a fireplace and sliding doors that take you to a deck that houses a six person hot tub! The fully equipped kitchen has many extras such as spices, and condiments in the fridge. The dining room seats six but there is additional seating for four in the kitchen island. The unit has cable TV in every bedroom and WiFi so you are always in touch. Washer and dryer and an additional powder room completes the package. We will consider pets for an additional fee. This townhome is just steps away from the shuttle service that comes continuously throughout the complex, so you never need to drive anywhere. On snowy conditions you can ski back from the slopes. We just purchased this little piece of mountain heaven. We have waited a long while to get a home in the mountains and we have finally found the perfect place! We wanted to get away from all the hassle of everyday life, but did not want to have to travel many hours to get there, so 7 Springs is the perfect place for us since it is only about an hour away! We plan on enjoying this place for many years and since it is an all season resort, we can spend plenty of fun in the gorgeous Pennsylvania mountains all year long. We hope you stay with us and find everything that you could want in our home. We are located at the top of the Mountain in Woodridge Village plan that is located in the Villages of 7 Springs Resort. Our unit is just a couple of steps away from the community pool house, volleyball court, basketball court and outdoor picnic area. Additionally 7 Springs run buses throughout the Village complex about every 20 minutes on weekends and the bus stop is at the edge of the yard! Perfect placement for those tired legs! After a long day on the slopes sit back in our hot tub and relax with a hot toddy or a cool draft. It just doesn't get better than this for a mountain stay. When you step into the front door you will see how spacious our townhouse is on the main living area. This was a must for us having many great get togethers with family and friends. We wanted to have maximum common space to accommodate the company and feel like you can share great food and drink all around a comfy fire and then relax in the hot tub to melt away those tired sore muscles from a long day of skiing, hiking, biking or just plain enjoying the outdoor life. This townhouse offers all of that in a luxury comfortable setting. No steps to climb to gain entrance to the townhouse and the natural light that large windows give a view worth seeing. We fell in love with this place and we hope you do too. You are located in 7 Springs Resort and you can enjoy all the amentities the resort has to offer. Driverway can accommodate two cars; however over flow cars can park in lot located just 20 ft away our back door at the pool lot. Has two large couches and additional seating. Large screen HD TV with DVD and cable. Sliding glass doors lead out to the deck and hot tub. Two units both a Kureg and Coffee Maker. Comes with filters. Fully equipped kitchen with all the necessities for cooking a meal, and I even provide some condiments. Seats 12 and the kitchen island seats 4.
plenty of games in 1st floor bedroom closet for hours of family fun. Tennis racquets, basketballs and a volley ball available for your use on the courts next door. It's just a two minute shuttle to ski out. Shuttle stop is right next to the backyard. Ski in if it's very snowy. one small step to get into first floor. First floor bedroom and powder room. It doesn't get any closer. Step of the deck and cross the street, only seconds away. Great 6 person hot tub located on our deck! 7 Springs is an all season resort that has it all, but the best thing about this area is the breathtaking views...and the best part of that is it is free! Come breath the fresh mountain air and take in some of the best views Pennsylvania has to offer! On the top of the mountain you can see three states...Pennsylvania, Maryland and West Virginia! 7 Springs is an all season resort with many fun things to do in all seasons that are just to numerous to list them all; however, some newer features are the four hour zip line tour in the summer and the new trails and lifts have to offer for the ski buff. You are within 20 minutes to many other attractions like Frank Lloyd Wrights, Fallingwater, white water rafting at Ohiopyle, Idelwilde theme park, and Fort Necessity to list a few othersfeatures.